The A.J. YOUNG Farm was purchased in 1885 to provide campus [& building –space] for the projected LOGANSPORT STATE HOSPITAL [at LONGCLIFF, CLINTON Township , CASS County , INDIANA] . The state of Indiana was confronted with the unusual created by the existence-on that farm-of this little Pioneer-Burial-Ground! Close to the very center of fractional section 34; T 27 N; R.1 E; [2nd IN P.M.]. This attractive little cemetery measuring about 625 square feet was located on a low grassy knoll which itself sits on barely 50-60 ft. south of the brink of the southern Terrace-Rim of the Wabash River Valley. This rim makes a steep drop in the institutions cultivated fields [in the bottom lands], along & just south of the Wabash River . 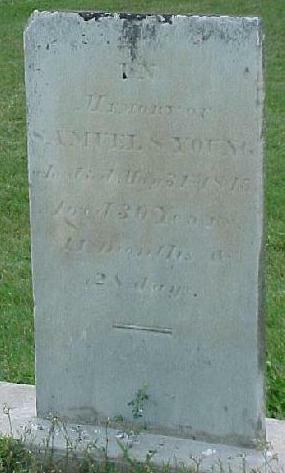 Cemetery is about 1&1/2 miles west of the city-limits [near the Cicott Bridge ] in Logansport . The state has praise-worthily preserved & is properly maintaining & caring for this particular resting-place of Cass County Pioneers; Despite the fact that Ward-Building “H & I” [the 4th ward bldg., immediately west of the Administration bldg.] is only a stone’s throw east of the cemetery & that the east wall of a large newly constructed [1938-9] ward bldg. [M & N] is barely 10 ft. west of the cemetery. Another large ward bldg., [R & S] looms only a short distance south. A 7 ft. wide E/W cement side-walk passes 28 ft. N. & a similar walk [N/S] runs about 2 ft. east of the cemetery. Person wishing to visit this cemetery are advised to familiarize themselves with the Rules & Regulations of the hospital & to see a visitor pass from the administration building in advance as certain days visitation might not be advised. The Large [15-16 ft. high] granite spire can plainly be seen in the lowlands from the E/W wagon-road several hundred yards to the N. on the South bank of the Wabash River . 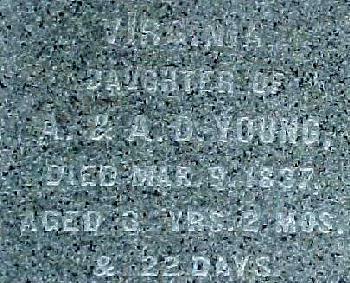 On the very large family monument is engraved “Virginia Young” & the same burial date but the age reflected as 3y-2m-22d. Don’t agree. R.B.W., Jr. reflected on why the 2 ages do not agree. 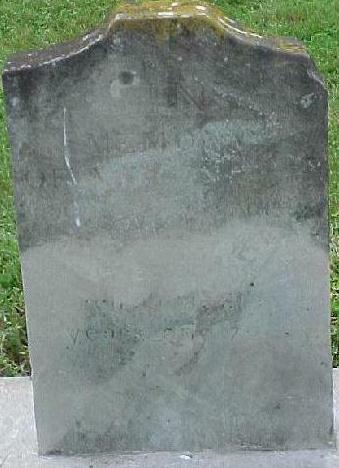 Could it be that the engraver made a mistake, could the stone have been misread or is this possibly another child? Historian J.Z. Powell gives George’s middle initial as A. though both monument & footstone read George G.
Mr. Jacob Minneman of Logansport says that some members of the SHANKLIN family may be buried here in unmarked graves. This burial ground for some years was “The Shanklin Farm.” It was customary in those days to bury young children close to home so it is possible that some unmarked graves are located here. 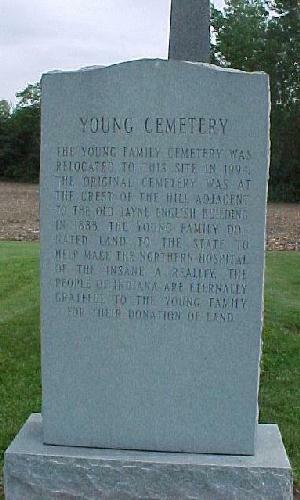 In 1995, the Young Family Cemetery was moved to the site of the Longcliffe Cemetery to make room for a building expansion of the Logansport State Hospital.